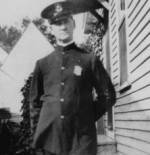 It was the early morning hours of September 23, 1928, when Officer James Roche stopped a male subject on the porch of 32 Temple Street suspected of committing a burglary. The male subject produced a handgun and ordered the officer to raise his hands. Officer Roche produced his service revolver and fired twice, bringing the man down to the ground. Once on the ground, the suspect fired six shots at Officer Roche, hitting him five times. Officer Roche was rushed to Nashua Memorial Hospital where he died of his wounds some 22 days later. Officer Roche was 53 years old at the time and a four-year member of the Nashua Police Department. He was survived by his wife and five children.